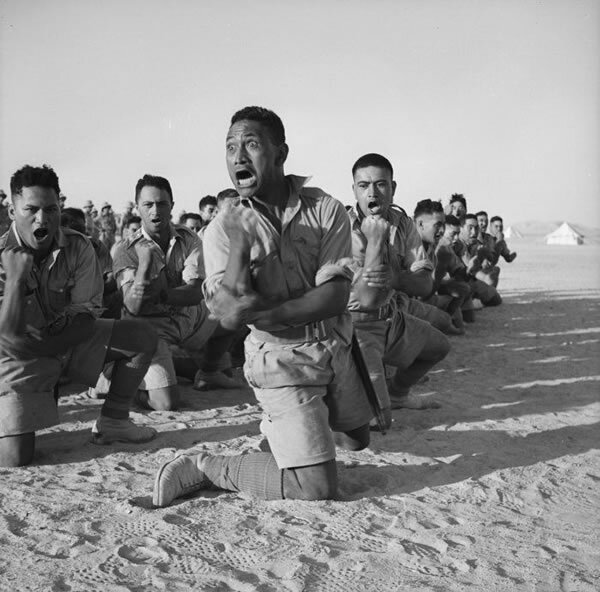 Members of the Māori Battalion's C Company perform a haka for the King of Greece at Helwan, Egypt, on 25 June 1941. The four men in the foreground are, left to right: John Manuel (from Rangitukia, later killed in action), Maaka (Bill) White (Wharekāhika, killed in action), Te Kooti (Scotty) Reihana (Rangitukia, wounded), Rangi Henderson (Te Araroa, killed in action). Read about the King's visit in the Battalion battle diary for June 1941. See another photo of C Company performing a haka during this occassion. bloody great photograph, thanks for posting this.